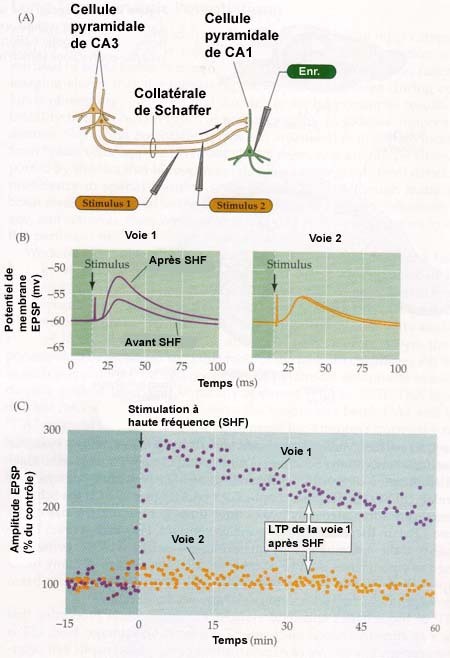 (A) Two stimulating electrodes each activate a different Schaffer collateral pathway, thus allowing the control pathway to be distinguished from the test pathway. (B) Synaptic response recorded in a CA1 neuron after a single stimulation of pathway 1, a few minutes before and one hour after a high-frequency stimulus was applied to this pathway. Note the presence of LTP revealed by a single stimulus. In contrast, for pathway 2, which did not receive any high-frequency stimulus, the response amplitude remains unchanged, indicating the absence of LTP. (C) Change in amplitude of EPSPs over time caused by single stimulations of pathways 1 and 2. The high-frequency stimuli applied to pathway 1 cause a sustained increase in the amplitude of the EPSPs in this pathway (purple dots). This increase persists for several hours, while the amplitude of the EPSPs in pathway 2 is unchanged. The diagram below illustrates two properties of LTP in a CA1 pyramidal neuron that receives connections from two different Schaffer collateral pathways. (A) Specificity. High activity produces LTP in synapses that are active (pathway 1) but not in neighbouring synapses that remain inactive (pathway 2). (B) Associativity. A weak stimulus in pathway 2 does not produce any LTP on its own. 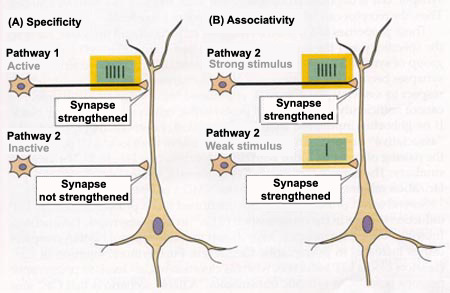 But if a strong stimulus is applied to pathway 1 at the same time as the same weak stimulus is applied to pathway 2, both synapses (pathways 1 and 2) are strengthened.